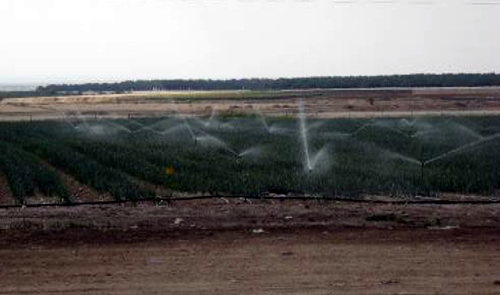 While Palestinians are starved for water, the Israeli settlement of Ariel has lush lawns and swimming pools, and settlements in the Jordan valley have wide-spread irrigation. Military Order 92, issued on 15 August 1967, granted complete authority over all water related issues in the Occupied Palestinian Territory (OPT) to the Israeli army. Military Order 158, of 19 November 1967, stipulates that Palestinians cannot construct any new water installations without first obtaining a permit from the Israeli army and that any water installation or resource built without a permit will be confiscated. These and other Israeli Military Orders remain in force today in the OPT and apply only to Palestinians. They do NOT apply to Israeli settlers in the OPT, who are subject to Israeli civilian law. 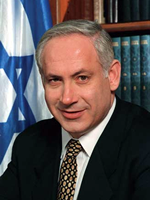 "And when I talk about the importance to Israel’s security, this is not an abstract concept… It means that a housewife in Tel Aviv can open the tap and there's water running to it, and it's not been dried up because of a rash decision that handed over control of our aquifers to the wrong hands." "Israel must hold on to the West Bank to make sure that Tel-Aviv’s taps don’t run dry." 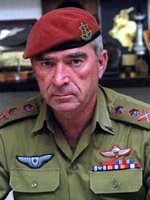 Rafael Eitan, Chief of Staff to Israeli Army (1978 to 1993) and subsequently Minister of Agriculture and Environment (cited in Lonergan and Brooks, 2004). "There is no reason for Palestinians to claim that just because they sit on lands, they have the rights to that water." Of the water available from West Bank aquifers, 73% is shipped to the State of Israel. Within the borders of the West bank 300,000 illegal Jewish settlers use 10% while 2.5 million Palestine’s have access to only 17% of their own water. Israeli settlements [in the West Bank] have a continuous s supply of fresh water. They have community swimming pools, flower gardens and broad expanses of green lawn. Meanwhile, approximately 140 Palestinian communities, have no running water at all. Palestinians have 83 cubic meters of water per person per year available while Israelis have 333 cubic meters per person per year. This means that each Israeli consumes as much water as four Palestinians. Since Israel occupied the West Bank in 1967, it has denied its Palestinian inhabitants access to the water resources of the Jordan River, preventing them from physically accessing the river banks. Israel consumes the vast majority of the water from the River despite only 3% of the river falling within its pre-1967 borders. Israel now diverts one quarter of its total water consumption through its National Water Carrier from the Jordan River. Palestinians had more water available per person before the 1967 invasion and occupation of the West bank and Gaza than they do now. Israel does not allow new wells to be drilled by Palestinians and has confiscated many wells for Israeli use. Israel sets quotas on how much water can be drawn by Palestinians from existing wells. When supplies of water are low in the summer months, the Israeli water company Mekorot closes the valves which supply Palestinian towns and villages so as not to affect Israeli supplies. 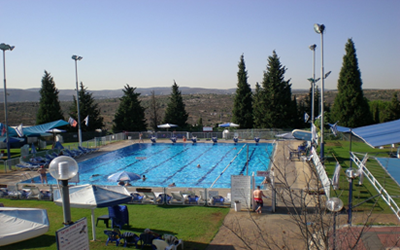 This means that illegal Israeli settlers can have their swimming pools filled and lawns watered while Palestinians living next to them, on whose land the settlements are situated; do not have enough water for drinking and cooking. Israel often sells the water it appropriates from the West Bank back to the Palestinians at inflated prices. [Palestinians pay four times the rate charged to Israelis]. During the 1967 war 140 Palestinian wells in the Jordan Valley were destroyed to divert water through Israel’s National Water Carrier. Palestinians were allowed to dig only 13 wells between 1967 and 1996, less than the number of wells which dried up during the same period due to Israel’s refusal to deepen or rehabilitate existing wells. 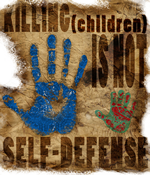 The Fourth Geneva Convention imposes obligations on an occupying power in relation to the inhabitants of the occupied territory, who are entitled to special protection and humane treatment. Depriving the local population of its water resources is an egregious violation of this convention. Israel is in violation of international law for collective punishment including destroying water infrastructure and storage. 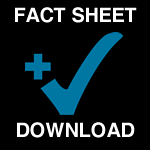 It is illegal under international law to distribute water in a discriminatory way. 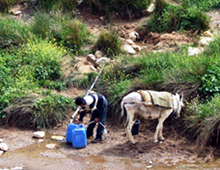 "There is no water in the village, so we have to bring it from far away and it’s expensive. I have nine children. We spend a lot of money on water and we have to make do with very little, just for drinking and cooking and don’t have enough for the other needs. We need more water for washing, washing the clothes and cleaning the house. I can’t wash and clean as often as needed. We can’t afford it. It’s a daily struggle." "The deterioration and breakdown of water and sanitation facilities in Gaza is compounding an already severe and protracted denial of human dignity in the Gaza Strip. At the heart of this crisis is a steep decline in standards of living for the people of Gaza, characterized by erosion of livelihoods, destruction and degradation of basic infrastructure, and a marked downturn in the delivery and quality of vital services in health, water and sanitation." The Wall is not only an Apartheid Wall, but also a water wall. Some of the largest Israeli settlements (such as Ariel and Qedumin) are built over the Western mountain aquifer, directly in the middle of the northern West Bank agricultural districts. This is exactly where the wall cuts deepest into Palestinian territory to surround and annex this vital water source. In the West Bank, approximately 50 groundwater wells and over 200 cisterns have been destroyed or isolated from their owners by the Wall. This water was used for domestic and agricultural needs by over 122,000 people. To build the Wall, 25 wells and cisterns and 35,000 meters of water pipes have also been destroyed. The Wall is obstructing many water run-off flows in the Qalqiliya region that normally divert water to prevent flooding. 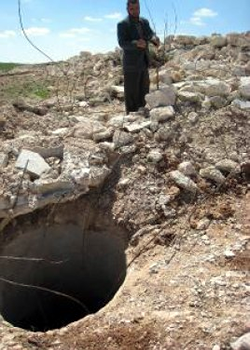 During the heavy rains in February 2005, Israeli soldiers refused to open drainage pipes in Qalqiliya, which led to heavy flood damage to crops and homes there. The Wall also caused severe flooding in Zububa and other villages. Under the conditions brought about by the siege imposed by Israeli occupation forces, civilians in the occupied territories are suffering from lack of access to necessary resources for the maintenance of their daily needs and basic health. The Israeli Defense Force (IDF) regularly destroys Palestinian access to water. 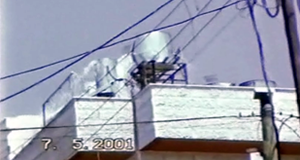 The photos above show examples of roof top storage tanks shot by a sniper in Aida refugee camp in 2001. 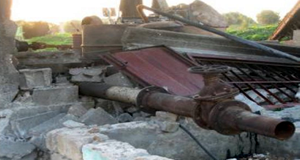 A water pump and well in the Zaytoun neighborhood of Gaza City destroyed in an Israeli attack in January.